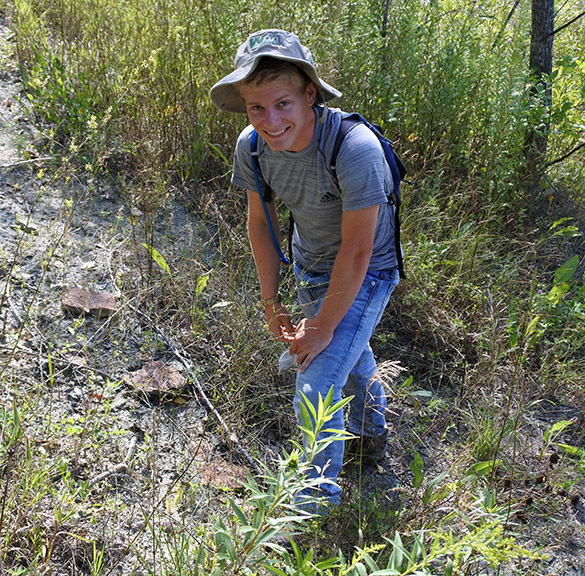 Rochester, Minnesota — It was a good day for fossil collecting on the Minnesota prairie. 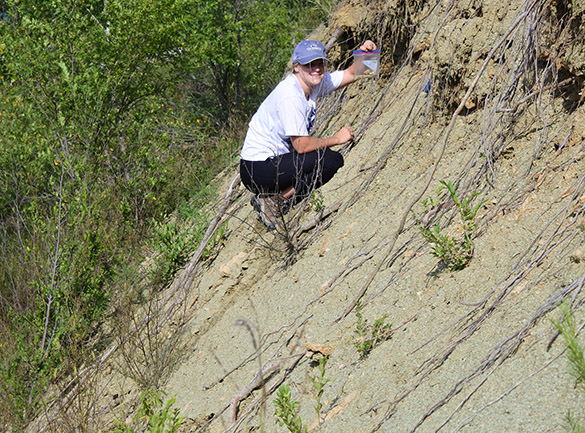 Above you see a handful of articulated orthid brachiopods collected by Nikki Bell at a quarry exposure near Rochester. This quarry has long been abandoned and is quickly reverting back to woodlands except for the steepest parts of the old walls. The grey streak visible through the trees is our site where the Decorah Shale is exposed. As usual, we worked on steep slopes with plenty of foliage. The fossils, though, were easy to find. The shale has thin limestone beds penetrated thoroughly by the trace fossils Chondrites (the small holes visible in the slab above). 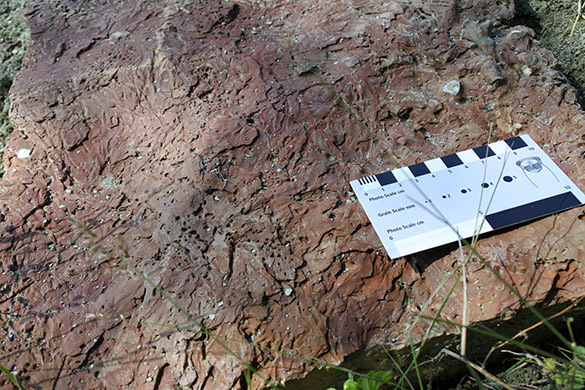 This particular rock shows hummocky cross-stratification on its top surface (the dips and ridges), almost certainly an indication it was deposited during an Ordovician storm. 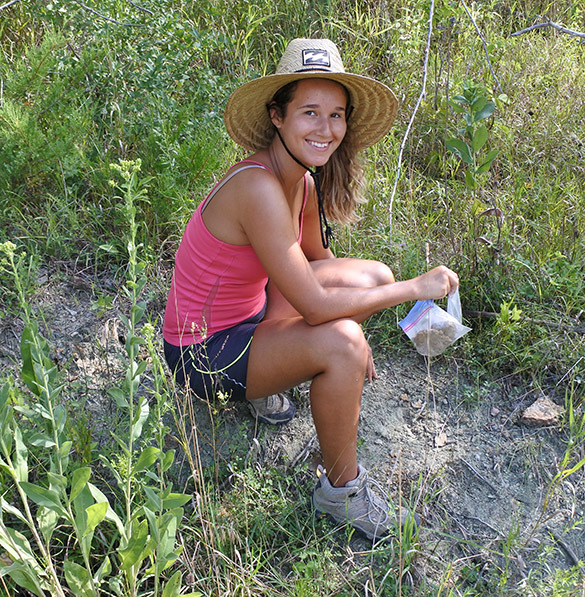 Rachel Wetzel (Pennsylvania) is working with the fossils from this quarry and our other Decorah outcrops to put together a general paleoecological reconstruction and then explore in detail the bryozoans. She is particularly adept at effortlessly clinging to steep slopes! 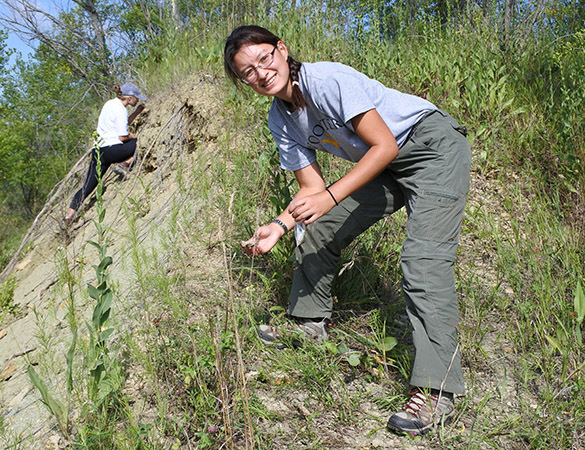 Nikki Bell (California) is working on the Decorah fossils with Rachel. Her specialty will be the brachiopods. 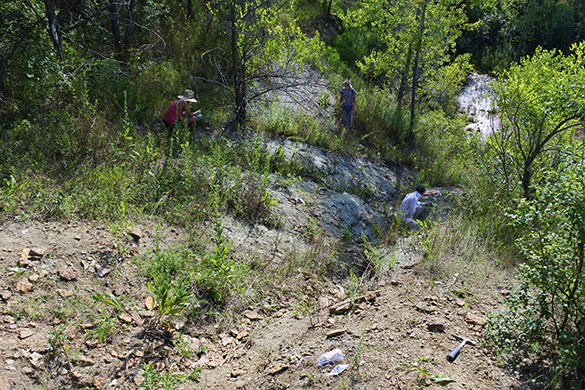 Etienne Fang (Maryland) is studying the “iron ooids” found in the Decorah Shale at this quarry and several other sites. 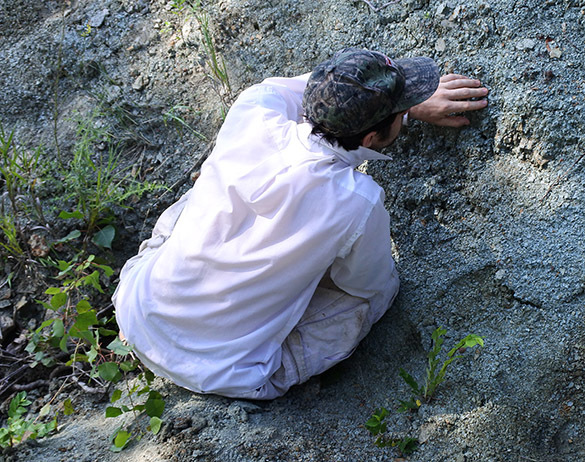 Dean Thomas (Virginia) will be assessing the carbonate petrology and conodonts of the Decorah Shale, along with the underlying Platteville and overlying Cummingsville Formations. 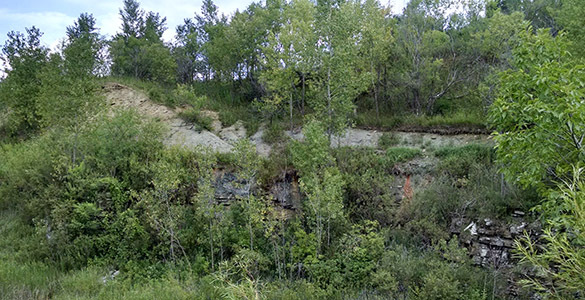 His main outcrop will be in Iowa, but he’s also collecting limestone specimens within the Decorah at other locations for biostratigraphic correlation. All four student projects are integrated, with the whole team collecting data and samples for each individual project. 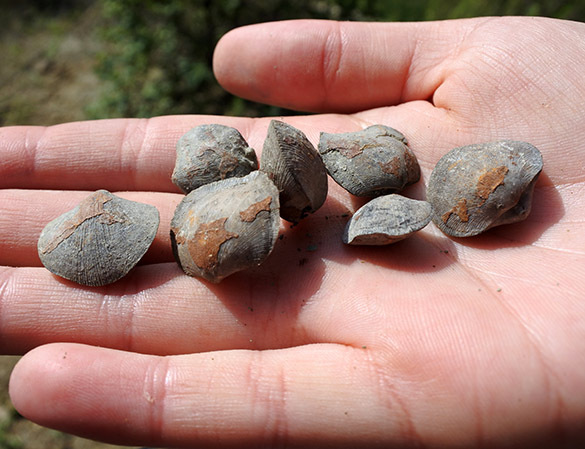 Our superb geological technician Nick Wiesenberg has also been collecting fossils for us. 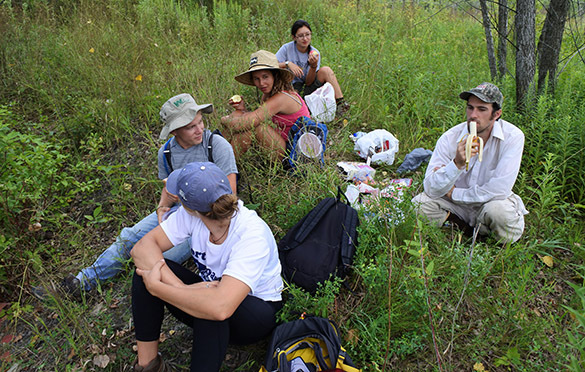 A typical lunch in the woods for us. We’ve had surprisingly few mosquitoes, and very patchy interactions with parasites. Dean is a tick magnet, and I’ve been badly chiggered! Our last stop of the day was the annoying Golden Hill roadcut (N 43.98788°, W 92.47962°). It is next to an off-ramp of US 52/63 so we have to reach it by descending through a bouldery, overgrown culvert from above. The students did their jobs, though, and did good sampling. This spindly green bush is wild parsnip (Pastinaca sativa), a plant we’re careful to avoid despite its abundance in some very inconvenient places. 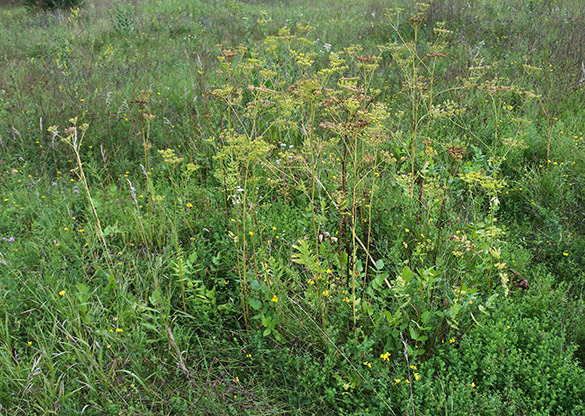 It is often referred to as poison parsnip for good reasons. These plants contain “furocoumarins, chemicals that when combined with skin and ultraviolet light can cause what’s known as a phytophotodermatitis”. 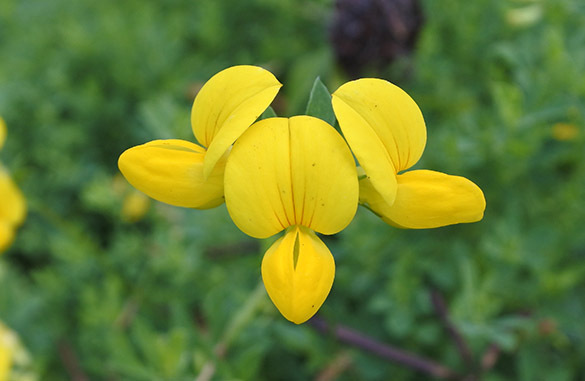 You have to contact the sap of the plant and then be exposed to the sun, so brushing against it is not a problem. We worry about grabbing a stalk and breaking it in our hands while clinging to slippery slopes. 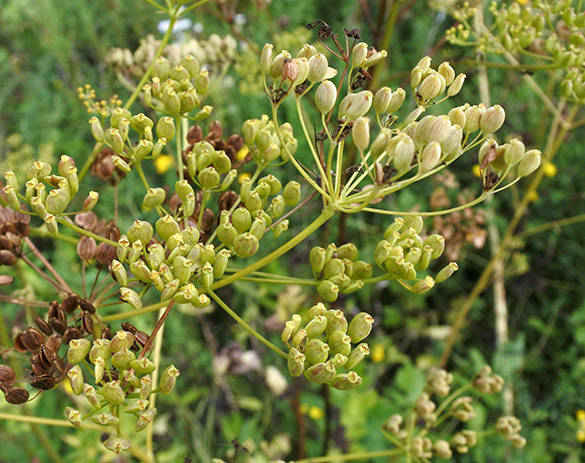 Here’s a closer view of the wild parsnip. 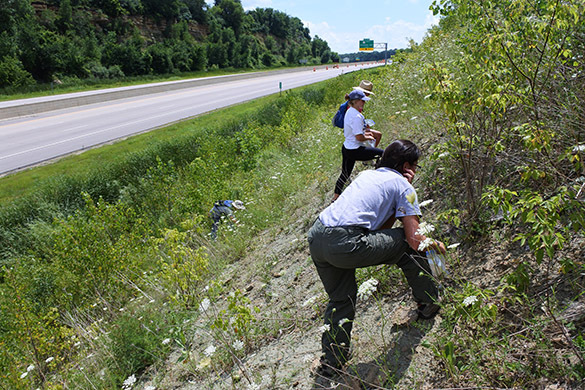 We also deal with poison ivy, stinging nettles, thistles and other sticker bushes. Sometimes I miss my desert fieldwork! It was a successful day for Team Minnesota, especially since we were able to end our work just before a bout of thunderstorms. Tomorrow we return to Iowa, which we hope will be much drier than it was yesterday.